Lately, I've been more and more interested in making things myself, instead of buying them from the grocery store. 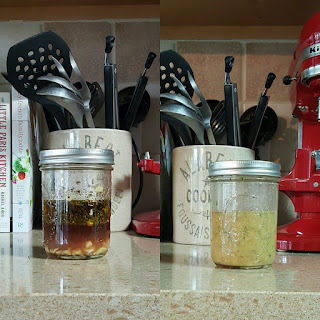 From spaghetti sauce to barbecue sauce to various vinaigrettes, the flavors that come from these home made version knock the store bought items of the water. It may seem like it takes more time to make these items yourself, bought they are all super easy. And, the items use are probably all in your pantry already! Today I'm sharing a new recipe for Greek Salad Dressing! This recipe is really simple. Just combine the ingredients and mix. I like to put all of the ingredients in medium sized mason jar so I can store for it later. Just put all of the ingredients in the jar and give it a shake. Now to pick out some salad ingredients!